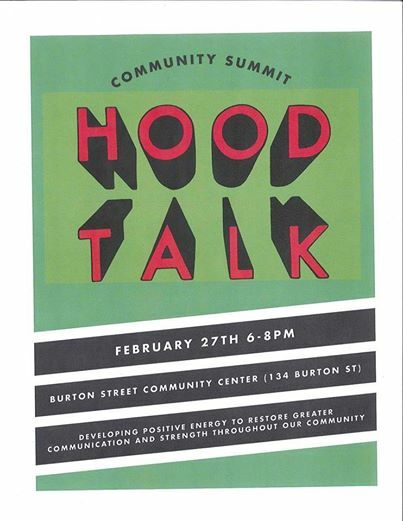 The first in a series of “Hood Talk” events happens this week. The focus of the series is to raise awareness of the challenges faced in African American neighborhoods and in public housing communities in Asheville, which are predominantly African American. The conversations will also address solutions to these challenges. Developing positive energy to restore greater communication and strength throughout our community in Asheville, from the North, South, East, and West. Come join us at the Burton St Community Center this Thursday 2.27.14 from 6 to 8 pm as we hear from caring folks from several neighborhoods in Asheville. This is a safe and chill place to listen to what you have to share about what’s going on in your hood, enjoy light food, entertainment, and inspiration while we create solutions to stay empowered and overcome challenges in our neighborhoods!